Designed specifically for in-house counsel, the Lexvoco In-House Legal Operations Masterclass will be held in Sydney on Thursday, 16 August 2018. This year’s event features General Counsel and Heads of Legal from a diverse group of organisations, including Telstra, NRMA and Channel 9, as well as a panel discussion on ‘Innovative Ways on Dealing with Disputes’ facilitated by Lawcadia’s CEO, Warwick Walsh. With a range of topics spanning AI, to emerging career paths, and mental health and well-being, it’s an event designed to facilitate discussion and encourage strong professional connections. You can buy your tickets and find more detailed event information here. Want to catch up with us at the event? 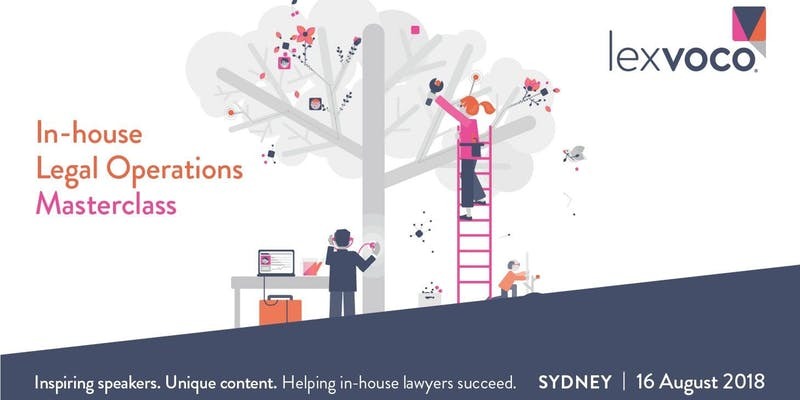 Our CEO Warwick Walsh will be in Sydney for the event and is looking forward to discussing emerging trends in legal technology and ongoing change in the industry. If you’d like to book in for a more detailed conversation, fill out the contact form below and we’ll be in touch to set up a time to meet. We look forward to seeing you there!